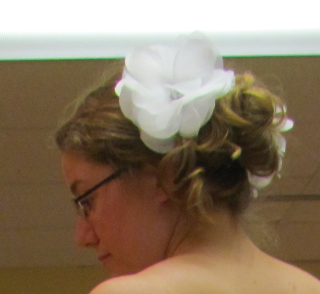 I have said from the start that I was going to wear a flower in my hair since I wasn't going to have a veil. Well, it then came to be three days before my final fitting, where my seamstress said that I should bring all my accessories with me, including the hair flower, belt, and jewelry. Cue the "Oh, Crap" face - because neither the hair flower nor the belt were made. I started rummaging through my fabric stash, looking for white fabric that I could use to make the flowers, and found some cotton, but those pieces ended up being too floppy. So, since I didn't want to make a trip out to the store, I remembered that I had bought some tie interfacing a while back when I was contemplating making the guy's ties for the wedding. I grabbed some of that, and although it was a little fuzzy, the thickness and rigidity of it was perfect. I made a template out of paper of how I wanted the petals to look, and then cut out the shapes on the tie interfacing and on the organza scraps that came off of my dress. I started layering the different pieces of fabric and rotating each layer slightly to give the flower a little more dimension. Then, my mom had a great idea. My dress came with a belt, but we weren't going to use it because it was gigantic and obnoxious, so we decided to take the jewels off and use some of those in the flowers. So, I sewed all the layers together in the middle, and then towards the end, I added a single rhinestone. I ended up making two hair flowers, one for each side of my chignon, and then my mom helped out by making the one for the belt, which actually has three rhinestones in the center so give it a little more bling. By the final fitting, we had both all of the flowers completed, we just didn't have the one for the belt attached to any fabric. At the fitting, we did determine that the hair flowers were too large, and it was going to be too busy if we used two in my hair, so we're only going to use one, and we're going to cut down the size of the petals. Which, I am fine with. It looks much better when it isn't so big. In terms of the flower for the belt, neither my mom nor my sister really like it, but the problem is that I've only pictured this dress in my mind with a belt and a flower, so I'm really stuck on it. I think it looks beautiful too, and that it draws attention to how small my waist is, but they see it as it makes my waist look thicker. I'm a little torn, but I think I'm just going to go with the way that I like it. What would you do? Would you do what you want, or take the suggestion from your family? Do they really know best? I've had a task on my To-Do List for a while, and every day that it's not done, a little reminder pops up on my phone to let me know that this hasn't been done yet. What is it? Up until a week ago, my sister was in Georgia with my parents still. Because we didn't close on the house when we were originally supposed to, they didn't move up here when it was originally planned. 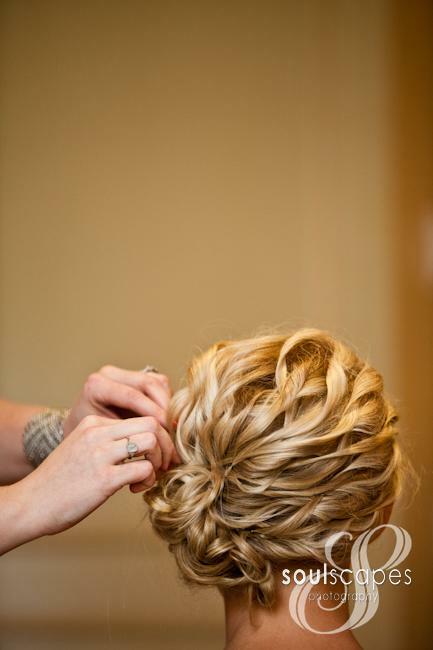 And since my sister is both my MOH and my hairdresser, that was a problem. This week, I finally told her to stop unpacking and find her curling irons - I needed to figure out my hair, and it needed to be right then. No exceptions. But, I didn't have to force her. She was willing to oblige. So, after dinner, we set up in the kitchen (bathroom electrical outlets aren't working yet - that's on the house to-do list ;) ) and she got to work on my hair. Turns out that since my hair is so long, it's really heavy, and so the weight of the hair is pulling all the curls out. Which means I may be getting a PWC, only it will be a Pre-Wedding Chop instead of a Post-Wedding Chop. But we continued with the trial anyways. As you may remember, I was inspired by these updos that I found a few months ago, and decided I wanted to try to recreate them. As you may also remember, I have very curly hair when I treat it nicely, so we thought that this could work. My natural curls though, are very messy, and don't look as nice as these do, hence the need for a curling iron. So, after the curling was done, MOH E got to pinning, and she did this rather quickly, so we know that it is messy. Some changes that will be made are that my hair definitely needs to be cut, because it was just too long to work with! I'd rather have it be too long than too short though! Also, my hair needs to be curlier, so we are going to try to use my Curlformers, which should help the curls stay in better. Also, the chignon is going to be a little higher up, because as you can see, it's slightly hitting my shoulder. We're also going to add some volume to the top because I need it. Oh, and the two flowers that I want will be in there too - they just aren't made yet. Yeah, I know. I need to get on that, too! If we have time, we may try it again for the day that I have my final dress fitting. But, what do you think? Pretty? Do you think we need to make any other changes? I have always really enjoyed reading about the stats on RSVPs from other brides, so I figured I would share my information here. We received 36 RSVPs back in the mail by our September 1st deadline. 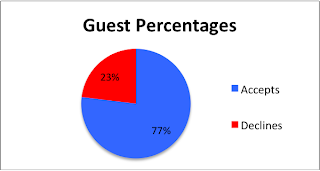 We spent the next week contacting our guests via phone, email, Facebook, and text message. As of right now, we have all but one response back, and the reasoning for that was that the invitation was supposed to be delivered in person to our real estate agent at our closing, but that was pushed back for a few weeks, so she didn't end up getting it at the same time as our other guests. We've told her that we just need a response by September 23, which is just before our final head count is due to the caterer. Overall, this is exactly where we wanted to be, no offense to the guests that we invited, but we were looking to land right around 80. We are, however, upset some of our family members and friends are unable to join us, and hope that they know they will be missed. 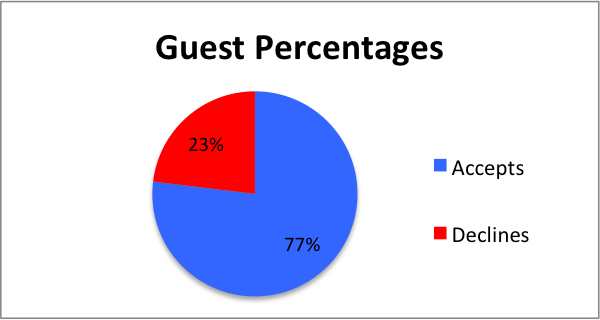 We're just over the wedding-standard rule of 20% of guests declining. Did you have numbers similar to this? Were you happy with the outcome of your RSVPs? Progress is being made very quickly in the house, and not at all in terms of the wedding, hence the title of this post. My To-Do List is still a mile long, and I really hope that we are able to pull it off. Today is officially 21 days until the wedding. This is crazy stuff, people. Crazy. I am hoping to have some time this week to start working on the centerpieces, as I still have to try to cut the wine bottles. If that doesn't work, it seems as though I will be going out to buy some vases. Thankfully, all our RSVP numbers are in, and we're exactly where we wanted to be. I'll do an RSVP Statistics post next, so you can all see how our numbers added up. 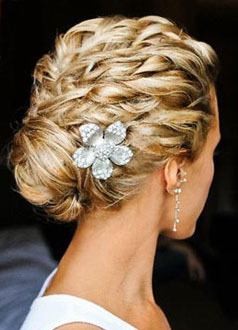 Hopefully my sister/MOH will be able to try some hairstyles out on me this week. I have a lot of hair, and we need to figure out really soon if she is going to be able to work with it. Tuesday we are meeting with the DJ to go over music selections, and ironically, none of the ones that I mentioned previously are ones that we chose! You will have to wait until recaps to figure out our songs. Between that and our next appointment, I will be figuring out the last of the must-have shots for our photographer. I have the formals narrowed down, but do you have any suggestions on some non-formal picture ideas? Next Saturday, ironically my parent's wedding anniversary, FI and I are going to meet with our officiant for the first time. We will hopefully get a good understanding of what the ceremony will be like, and possibly even decide on some readings. We are really trying to keep it to under 20 minutes, so I really hope that he is able to accomplish that. Lastly, I would really like to try to get the rag rug done, but I know that it is such low priority compared to everything else on the To-Do List. Lots and lots to do - thankfully I have my mom and my sister up here now to lend a hand. I think it's finally time to ask for help, what do you think? I can't believe that we are at the one month mark already!! The big day is fast approaching, and if you take a look at my To-Do List, things are being crossed off, just not as quickly as I had hoped they would be. Then again, I also thought we'd be in our house by now, but we're not. Surprise, surprise. But, with meetings scheduled with vendors, and some projects to complete (and begin!) we're going to be really busy for the next 30 days! Many brides have been finding alternatives to your traditional guestbook for their wedding. 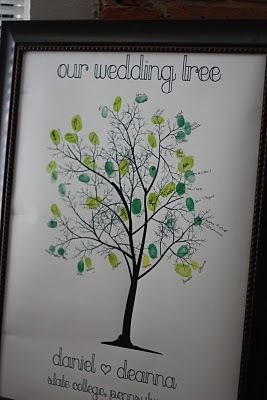 Ideas such as benches, thumbprint trees, and rock messages give us brides inspiration every day. I thought that this was such a cute idea. The one thing that I didn't like about it, however, was that the envelopes were still stuck in a book - something that I thought would never get opened after reading through it once, and would just collect dust on a shelf, or worse, get packed away in a box of sentimental items and never very infrequently seen again. So, I brainstormed different ideas, and came upon one that resolved all problems. I decided that since leaves were kind of our theme for the wedding, and we were using them on invitation paper amongst other things, that I would arrange the envelopes in the shape of a leaf. 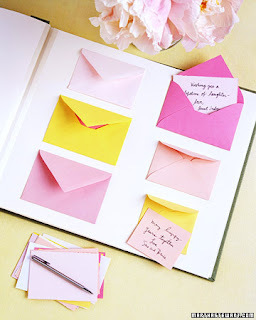 This would allow the guests to write us little notes, put them in an envelope, seal them, and then give us the opportunity to hang the piece of artwork on the wall in our new house. For paper, I decided to go to my trusty website, Paper-Source, and peruse the envelopes they had available. 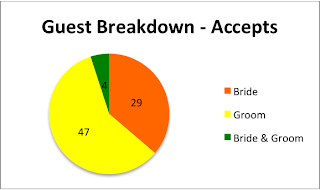 I was looking for some that I thought I could layer nicely, and that the flaps weren't too large, so I ultimately decided on coin envelopes, and to match them with everything, I chose the three main colors of our wedding: orange, yellow, and green. Today, since we still haven't moved, I figured I should take advantage of the long weekend, and get some wedding related tasks done. So, after unpacking a few wedding boxes, I got to work with laying out my envelopes on a piece of foam board for sturdiness. I used some cans of tomatoes (even though I hate tomatoes) as a weight to hold the base in place. The extra large cans were perfect for holding the envelopes where I put them. I staggered the envelopes unevenly, making sure that each one was able to close and open without interfering with another. I started at the bottom, and filled in the middle first, just laying everything out as I thought how it should be placed. As you can see in the picture above, I also added a stem to the base of the leaf. Towards the end, I had to remove some envelopes and replace them with different colors, that way the top of the leaf didn't end up being all yellow envelopes, which is what I ended up with at the end, despite having the same number of envelopes in each color. 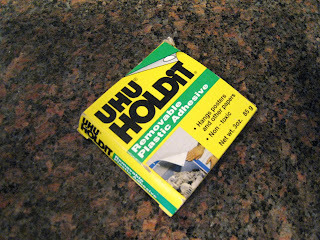 Next, I used Uhu Holdit to place each envelope on the foam board. Because I didn't want to remove every single envelope completely to put an adhesive on it, I decided to use this putty, and place little rolled up pieces of it on the corners and centers of the envelopes, where I thought would hold each one in place. It took about an hour to get every envelope stuck down completely, but I didn't think it actually felt like an hour. I plan on trimming the foam board to make a rectangle just around the leaf, and then I will place it on an easel at the wedding. After the wedding, I will cut the foam board to match the lines of the envelopes in the leaf pattern, and then hang it on the wall in the office. I also bought coordinating business cards from Paper-Source, which fit perfectly in these envelopes, so our guests will be writing us little notes on the business cards, and then finding an envelope of their choose to put their message in. I'll use glue dots, put on at the last minute, to seal the envelopes shut. Anyone else doing a non-traditional guest book? Where did your inspiration come from?